Essays of mixed quality on mixed issues by a writer of mixed ethnicity. 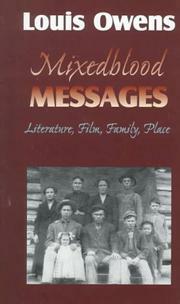 A resident of the Choctaw-Cherokee-Welsh-Irish-Cajun mixed space lying in between —unhyphenated cultures,— University of Oklahoma English professor and novelist Owens (The Sharpest Sight, 1992) writes acutely of a generally accepted fact of American life: that most of us come from mixed backgrounds, our pedigrees a tangle of bloodlines and nationalities. In his instance, this tangle becomes problematic: billed as a Native American writer but shunned by certain Native critics (such as the Lakota scholar Elizabeth Cook-Lynn, who comes in for quite a shellacking in his pages) for not being pure enough of blood, Owens is no garden-variety WASP, either. His examinations of works by Native writers such as N. Scott Momaday and Gerald Vizenor explore their negotiations between ancestral cultures and the dominant Anglo culture of the university and the publishing world; these essays are unfailingly interesting (if sometimes too heavily burdened by current critical jargon). So, too, are Owens’s dissections of the portrayal of Native Americans in hallmark films like Kevin Costner’s Dances with Wolves (—from beginning to end, the perfect, exquisite reenactment of the whole colonial enterprise in America . . . beautifully disguised as its opposite—) and John Ford’s The Searchers (John Wayne’s —most profound role in what [the film medium] has to say about America’s eroticized hatred of the indigenous peoples of America—). Less interesting, however, and less successful, are his autobiographical excursions, which seem marked by a curious distance, as if Owens cannot quite find himself as a character in his own story; instead, he reiterates again and again his mixed-blood status, which forces him —to check a single box on every form,— without ever saying how this status affected his development as a writer and scholar. A valuable addition to Native American studies, nonetheless.